Chromefest is a tribute to classic American cars, hot rods and rock & roll music. Heaps to see and do and the winner of the Pinup Doll Australia 2014 will be crowned there! ChromeFest Ball: Friday 24th October: Enjoy a fun filled evening in the spirit of the 1950s Rock 'n' Roll and Classic American autos. More info here. Twilight Cruise: Saturday 25th October: Don't miss the continuous car cruise from 5:00pm - 6:00pm. View the cruise map here. 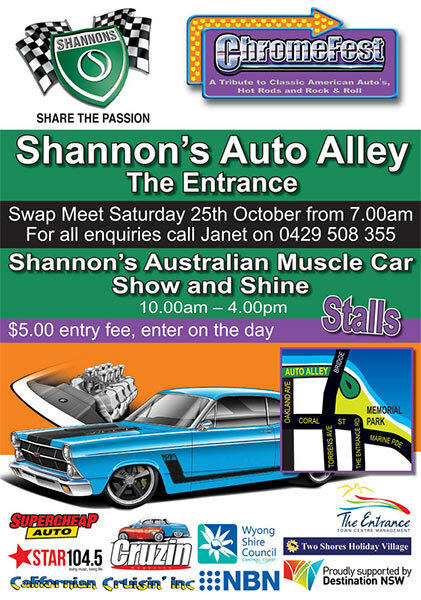 Show 'n' Shine: Sunday 26th October: Gates open at Memorial Park at 7:00am and close at 8:00am sharp, so be early to display your car! The gates will re-open at 3:00pm. Check the website here for entry form to register. Entertainment: Three days and three stages with a fantastic line-up of rock 'n' roll and rockabilly bands plus DJs Vinnie, George Galea and John Ryan.